When you Google “what to know before getting a small business loan,” the results provide list after list of steps, requirements, and guides to getting a loan. That’s a lot of information to look through, so to simplify getting answers, we invited our friends at Fundera to join the #QBOchat. Fundera is a safe, friendly, and free online marketplace for small business loans that has helped secure funding for more than 1,200 small businesses with more than $60 million funded. Meredith Wood, Head of Content at Fundera, manned the @fundera handle for the chat. Q1: How do I know if I can afford a loan? This seems like a simple enough question, but there are many factors to take into consideration. One of the most popular answers was that businesses cash flow should be at a minimum 1.5 times greater than debt payments. @fundera: The first thing to do is to look at your debt service coverage ratio. This helps ensure you have enough cash coming in to afford the loan payments. A good question was raised by @alisonatintuit: I think getting a loan may be scary for some business owners… what does the group think about that? Q2: What type of financing is available to businesses? Every business is different and that means different financial needs as well. This also translates into different loan options. As @fundera pointed out – it’s best to apply for a loan before you need it, you’ll get better rates that way. Depends on how your business is financially. The best borrowers should look at bank loans and SBA loans. If you’re still building up your business financially, short-term loans might be your best bet. There’s also specialized financing, like invoice financing and equipment loans. Each of the products Fundera offers comes with pros and cons. They are all outlined here. Q3: What are some good reasons to get a loan? The most popular answer here was growth. Sometimes a loan is needed to get to the next level and beyond. Often with growth comes the need for funds to hire more employees, a new location and/or equipment, expanded marketing efforts, and to further cash flow, all of which can be covered with a loan. @alisonatintuit: Debt can be good, if it is structured the right way, and take out for the RIGHT reasons. I’ve never been a fan of “spend while you have it” and then “borrow when you don’t” – a good acct or bkkpr can advise! Chatter @vrcqbpro mentioned “Working capital for seasonal businesses,” which brought up some thoughts on seasonal business operations. Q4: What are some bad reasons to get a loan? 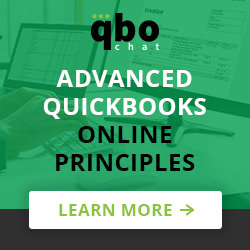 @QBOPro: To keep a failing business going, throwing good money after bad. @fundera: To take advantage of discounts on inventory or supplies your business doesn’t really need. To pay yourself a salary. And really anything that won’t allow you to *make* money off the investment. @EileenRSassCPA: Borrowing when you do not understand why – not managing the cash flow and understanding in real time where you are! Q5: What can accountants do to help their clients get a loan? @vheckman: Use tools that can make it easy for them to understand financials before they get out of control! @PandRAccounting : Most business owners need their financials explained to them! Help them spot cash crunches &amp; growth opportunities, and let them know you can help them find a loan to make it happen. If they need funding, they should come to you first. This keeps them from working with bad-news loan brokers. Thank you to Fundera for taking the time to join our chat. If you’re looking for more information, check out the Small Business Loan Toolkit on Fundera’s website. Leave any further comments or questions below. We’ll see you next Thursday at 3PM Eastern/12PM Pacific for the next #qbochat. Andrea Mestdagh is an award-winning communications and marketing professional.